Come On! Let’s Boogie To The Elf Dance! to symbolize the Christian 4GW. The original design was by James Greece of Catholic and Loving It, with a minor change by Lexington Green of Chicago Boyz. As long as the subject is Christian symbolism, I also wanted to point out “It’s Christmas! Let’s be glad!” by Sufjan Stevens. Sufjan describes his church as “kind of Anglo-Catholic,” so the Christian and Marian themes shouldn’t be surprising. Listen to the song on last.fm, download from podbop, or purchase from Amazon. True Sufjan fans may appreciate the animated YouTube video of ‘Put the Lights on the Tree’. One of the best things about YouTube are how works of art — which otherwise would languish on their creator’s computer or never be made at all — become viral on the net. Rx’s “Freedom 101” (previously featured here and by Mountainrunner, Sean, and ZenPundit), for instance, is an amazing mashup of ideology, freedom, and principle. However, the artist himself is busy running for President) and hasn’t provided an mp3 on his web site. So how to listen to it on my iPod Mini 8GB? Vixy is also an open source project that converts youtube’s flac format to standard ones. Until google implements a “Save As” feature for YouTube, vixy’s website offers a free, fast translator supported by ad-revenue. I recommend it. I also tried vixy on LOST breakbeat and Reggae Soviet Anthem. Both worked fine. Thanks vixy! MLK, Reagan, Kennedy Music Video: Rx’s "Freedom 101"
Some things just keep getting better and better. The musician Rx is one of ’em. His mashup of the Clintons and George Bush, Happy Christmas & A Whole Lot of Love, is a classic. His music video of the President singing Sunday, Bloody Sunday is clever. But nothing he has done compares to his new music video: Freedom 101. Now all Rx has to do is link to the MP3 version, and I’m good to go! Sean Meade very kindly emailed me full-length videos of Sufjan Stevens playing some of his works on the PBS program Austin City Limits. I also found a lower quality recording, apparently from the same event, of The Transfiguration. Update: The audio of the entire concert is also available. 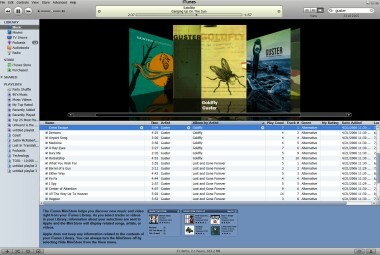 Props to Apple for iTunes 7, the first program with a 3D interface that isn’t terrible. Generally, 3D is used to increase flashiness and destroy usefulness. From numerous forgetting web browsers to games, such as Half-Life 2 and Warcraft III, designers have labored hard to make programs slower, more sluggish and less user friendly by adding the glitz of the z-axis. Apple has bucked that trend. iTunes 7 incorporates a nifty tool that lets you “flip” through albums on your computer, and it will even download album art off of the iTunes store if you do not have it already on your computer. Apple calls this technology “Cover Flow,” and it is an easy, intuitive, and relaxing way of browsing the music you own and what you want to play next.